Jovan Belcher of the Kansas City Chiefs watches from the sidelines during his final game against the Denver Broncos at Arrowhead Stadium on Nov. 25, 2012, in Kansas City, Mo. 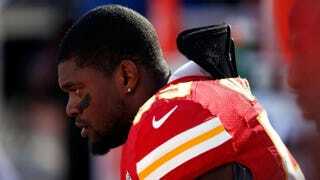 The mother of former Kansas City Chiefs linebacker Jovan Belcher has filed a wrongful-death lawsuit against the team after his body was exhumed so that his brain could be examined for trauma, the Kansas City Star reports. Cheryl Shepherd reportedly filed the suit in Jackson County Circuit Court in Kansas City, Mo., Tuesday, charging that Belcher was subjected to "repetitive head trauma" and that the Chiefs failed to provide adequate medical care before he killed his 22-year-old girlfriend, Kasandra Perkins, and then turned a gun on himself in December 2012, the report shows. Shepherd is seeking a jury trial and unspecified damages. Belcher's body was exhumed last month at the North Babylon Cemetery in Bay Shore, N.Y. His brain is being examined for evidence of chronic traumatic encephalopathy, also known as CTE, and the family is awaiting final results, the report shows. A Chiefs spokesman told the Associated Press that the team was aware of the lawsuit but could not comment on pending litigation.